Thought this game may be popular, not much else available really. It was only when we got to Stoke Lane that we realised how popular! The car park was rammed - mind you Kev still managed to find a prime spot, aided ably by a friendly steward. The parking spot meant that after the final whistle had blown, we were the first out of the place .....result!!! Not been to a Carlton home game for a while - the Millers are doing well in Evo-Stik Division One South, currently lying in third spot. The last time we saw them was in the Notts F.A. 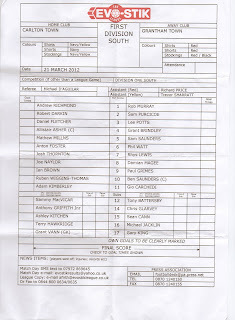 Senior Cup - they beat Arnold 6-3, but their performance wasn't the best!!! This game saw them entertain the league leaders, and with a decent away following the official gate was 272. We actually caught up with good friends Judith and Barry Wilkins during the break - we've been trying to reunite with the Loughborough couple all season, but unsuccessfully. Great to see the love-birds again!! Stood with Deadly Derek, Mr. Mac and Rob Townsend for the first period, after having had a good chinwag with Nick "Sticky" Palmer. Sticky doesn't do nil-nils - although this looked like it could end that way. Until the introduction of Sam MacVicar that is. The tall striker came on for Ian Brown who was stretchered off after picking up a leg injury. It was MACVICAR who netted on 61, diverting the ball into the net after Wiggins-Thomas's shot looked to be heading out for a goal-kick. Grantham striker Paul Grimes was challenged hard by Adam Kimberley on 84, and although Mr. D'Aguilar awarded the free-kick to the Gingerbreads, he then showed a straight red card to Grimes, no other option - the no. 9's retaliation punished in full. The sending off seemed to charge up the visitors, and they poured forward causing all sorts of problems for a suddenly shaky Carlton back-line. In the 88th minute, Grantham levelled through PHIL WATTS, the big man firing through a crowd of players after Carlton keeper Andy Richmond had made a terrific save from a corner. So, after going down to 10 men, and levelling the scores, the visitors looked favourites to possibly nick it - especially when Mr. D'Aguilar indicated their would be 10 minutes of added time! What a final 20 minutes that was! Well worth the entry fee.....talking of which, the Millers have done the decent thing and reduced the entry fee to next Wednesday's Notts F.A. Senior Cup semi to £5. We'll be there!!! 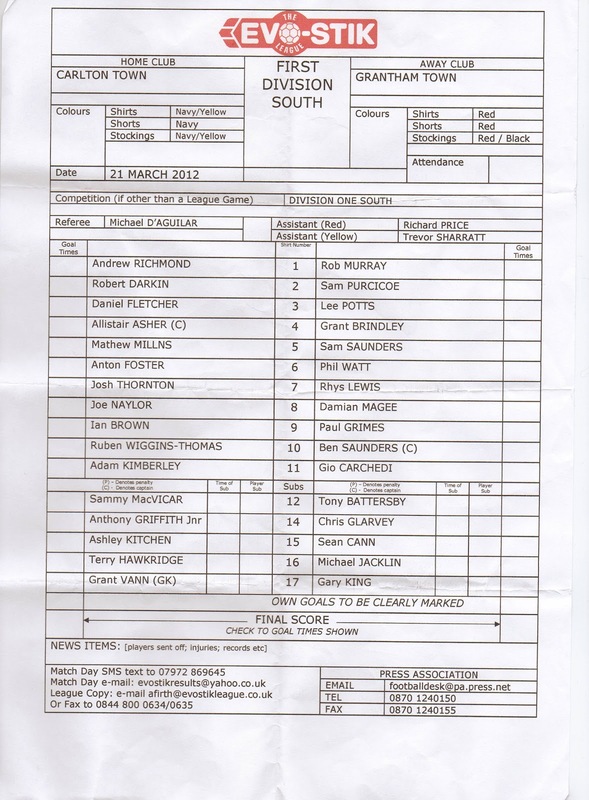 Programme - didn't collect one, but thanks to Carlton Town for the free team sheet.